Mister Mixer is an innovative concept that uses draught technology to serve authentic cocktails in seconds. Created by young entrepreneur Valjean Boynton, the brand is quickly becoming a staple of Australia’s stylish events and busy bars. Mister Mixer cocktails are crafted in small batches the traditional way, using established recipes and mixology techniques. Then they are simply decanted into kegs for quick, simple service. The result? Consistently perfect cocktails in moments. Mister Mixer’s range comprises seven classic cocktails including Green Apple Mojito, Passionfruit Caipiroska, Classic Sangria and the Classic Cosmopolitan. Each cocktail was created by Boynton himself and uses premium juices with no artificial colours or flavours. Today, Mister Mixer is Australia’s number one draught cocktail brand. Poured at major events such as the Spring Racing Carnival, Queen Victoria Night Markets and the Australian Tennis Open, it is also available in Hamilton Island and at many of Australia’s iconic coastal venues. Mister Mixer is fast becoming the wedding industry's preferred way to serve cocktails, recently winning 'Best New Concept' at the Wedding And Events Of Australia Awards. Passionately involved with every aspect of his business, Boynton still oversees the creation of every batch of Mister Mixer cocktails. Mister Mixer has recently commenced its first national sponsorship as the official cocktail partner of the 2014/15 Open Air Cinemas. Open Air Cinemas is a quintessential outdoor event, visiting each capital city to schedule feature films at sundown. Audiences are encouraged to chill out before each movie with food and beverages from the licensed bar while they listen to live Australian music. The Mister Mixer sponsorship includes supply of event bar equipment, POS and branded serving accessories including swizzle sticks. Mister Mixer founder Valjean Boynton says “Open Air Cinemas is a terrific fit for Mister Mixer. It’s a well-run event that provides a relaxed, outdoor social experience for audiences. The fact that it visits every capital city gives us an ideal opportunity to introduce Mister Mixer to new audiences in just the right context”. St Kilda Festival is Australia’s largest free music festival, with crowds of more than 350,000 people expected to attend in 2015. This year Mister Mixer will commence a partnership with the event, which will include creating the ‘St Kilda Festival Mojito’ to be served at festival bars and participating St Kilda venues. Mister Mixer will offer all participating outlets POS and branded cocktail serving equipment, as well as the option to also serve its Passionfruit Caiprioska. Boynton says “We’re really excited to support the St Kilda Festival this year. It’s exactly the right environment to showcase Mister Mixer’s strength – serving quality cocktails in large volumes in our own backyard. We’re looking forward to generating widespread awareness and trial of our signature cocktails”. The team behind Mister Mixer is again delighted to create the ‘Centre Court Cooler’ cocktail for the Australian Open. Served in the Jacobs Creek wine bar in Grand Slam Oval, the cocktail is designed to add a refreshing twist to the tournament's beverage menu. Patrons will have the option of buying it in a standard cup for $10.30, or paying an extra $4.70 for a Jacob's Creek souvenir glass. Mister Mixer's popular Green Apple Mojito and Passionfruit Caprioska will also be served in the Grass and Grain Bar, Arena Café and Champions Bar. Mister Mixer is Australia’s leading range of quality cocktails served on tap. Offering high margins, low wastage and quick turnover, the brand is proving popular with large venues and events. Launched in 2011 by Valjean Boynton, the Mister Mixer range comprises seven appealing cocktails including Green Apple Mojito, Classic Sangria and Passionfruit Caiprioska. Using premium juices and no artificial colours or flavours, each Mister Mixer cocktail was created by Boynton himself and delivers an authentic flavor that stays true to its original recipe. 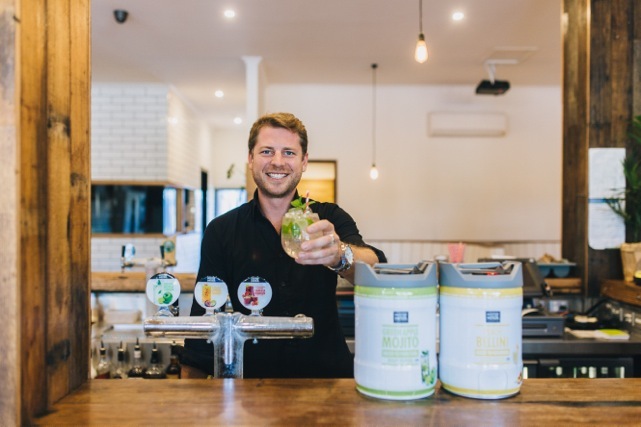 Packaged in 5L party kegs, as well as 30L kegs that can be tapped into any existing venue system, the cocktails offer margins of up to 75 per cent. Importantly, venues take just a fraction of the usual time to make quality cocktails in single serves and shared jugs. The theatre of traditional cocktail-making can be retained by using Mister Mixer’s recommended garnishes and glassware. Mister Mixer is already enjoying success in the event sector, recently proving a hit at the Australian Open in Melbourne.